Country Matt, as he was known on the hit show Pitbull and Parolees on Animal planet, had an amazing wedding! His lovely bride planned a gorgeous vintage style wedding at Pearl Street Grill and Brewery in downtown Buffalo. They had a beautiful June wedding in 2016. They had amazing and comfortable weather too! You never know what kind of weather you will encounter in Buffalo, NY! We started the day at Pearl at the Webb Hotel. The bride and groom both got ready there. We did a first look in one of the rooms. Then headed out to Tift Nature Preserve in Buffalo for wedding party portraits. We had about 20 minutes to get all of these done too. Hair and makeup ran a little late. But, no worries, We got some great pictures at Tift! During the reception, Neal always likes to take a walk around the area to get ideas for an end of the night photo session. He came back all excited about the building we were going to take Jill and Matt to. This building, which I can not reveal it's name (I honestly to do know the name) was always a location Neal wanted to use for photos. We only needed the perfect couple to fit the style. Jill and Matt were it! On the walk over, Neal mentioned the building resembled something out of Gotham City in Batman. Jill and Matt immediately responded that they loved Batman and were huge fans. We knew right then, these newlyweds were the couple for this building! This image was meant to have a dark vintage feel! It worked out great with Jill's lace dress and Matt's dress pants and suspenders! They have such great chemistry too! Matt is keeping his cool, with hand in the pocket, but pulling in his wife with such passion for a kiss. Neal decided to shoot this image on the darker side. 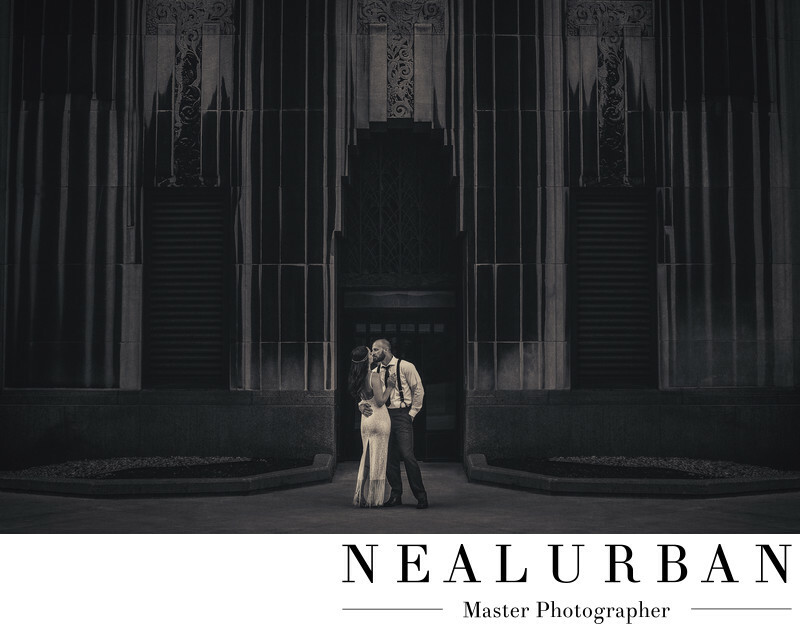 We did not use any lighting on the couple or to light up the building. It wasn't completely dark outside either. So we were able to do it this way. In post production, Neal even darkened the photo a little bit more to make it look more like Gotham City. It had to be black and white as well! This photo was a great way to end the night and captured the couples style one hundred percent! Location: 76 Pearl St, Buffalo, NY 14202.